Floods are common in the United States. Weather such as heavy rain, thunderstorms, hurricanes, or tsunamis can cause flooding. Flooding can also happen when a river or stream overflows its bank, when a levee is breached, or when a dam breaks. Flash floods, which can develop quickly, often have a dangerous wall of roaring water. The wall carries rocks, mud, and rubble and can sweep away most things in its path. Be aware of flood hazards no matter where you live, but especially if you live in a low-lying area, near water or downstream from a dam. 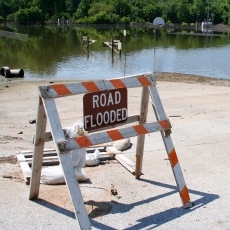 Although there are no guarantees of safety during a flood, you can take actions to protect yourself. You should have a disaster plan. Being prepared can help reduce fear, anxiety, and losses. If you do experience a disaster, it is normal to feel stressed. You may need help in finding ways to cope.